One in 10 communications companies claim to have deployed 5G technology already, according to a recent survey (see: With 5G technology, the time is now). Some parts of the 5G standard are close to being finalized, but nothing has been ratified yet. Furthermore, many of the constituent technologies (e.g., mmWave RF, beamforming, MIMO, etc.) are either new or not commonly used. SDN and NFV are considered critical enablers of the heightened utility and expanded flexibility that will be hallmarks of 5G networks. The industry has a learning curve to climb. The recent set of announcements can be considered an indicator that the industry is beginning to surge up that slope. Maailmalla on 1,5 miljardia 5G-liittymää vuoteen 2024 mennessä, ennakoi Ericsson uudessa mobiiliraportissaan. 5G-kännyköiden lisäksi mobiiliverkkoihin pohjautuvien IoT-yhteyksien määrä kasvaa, kun NB-IoT- ja Cat-M1 -teknologioita otetaan yhä yleisempään käyttöön. The U.S. government has initiated an extraordinary outreach campaign to foreign allies, trying to persuade wireless and internet providers in these countries to avoid telecommunications equipment from China’s Huawei Technologies Co., according to people familiar with the situation. Sveitsiläinen u-blox on esitellyt LTE-verkkojen IoT-moduulin, joka tukee valmistuvaa uutta LTE Cat NB2-standardia ja toimii kaikkialla. Moduulista on kehittäjille tarjolle versio Kiinaan. Toinen versio tulee NB-IoT-taajuuksia kaikkialla muualla. Moduuli on myös 5G-valmis. 4G-verkossa datakanavien lomassa toimiva 200 kilohertsin levyinen IoT-kanava tuotiin osaksi standardia 3GPP:n Release 13 -määrityksissä. Tällä NB1-tekniikalla IoT-laitteisiin tuotiin 60 kilobitin datansiirtonopeus verkkoon päin. Release 14:ssa tuodaan tekniikasta toisen polven evoluutio eli NB2. Siinä data liikkuu solmuista tukiasemaan 160 kilobitin nopeudella. Toiseen suuntaan linkki kiihtyy NB1:n 20 kilobitistä NB2:n 120 kilobittiin sekunnissa. 4) as FCC Commissioner Rosenworcel recently noted, the U.S. Administration’s trade and other multilateral policies significantly impair U.S. ability to excel in the global 5G revolution. The device will use processors from Qualcomm, which is hosting a conference this week in Hawaii. Britain should think long and hard if it’s comfortable with the Chinese building its 5G network. The head of MI6 has warned the UK over the role of Chinese firms in building the country’s 5G infrastructure. In a rare speech, the UK Secret Intelligence Service boss said the UK should think long and hard before working with Huawei, or any other Chinese company, following past concerns. Alex Younger said Britain needs to think if it’s comfortable “with Chinese ownership of these technologies”. For a few hours on Tuesday, 5G cellular was live — warts and all — in two ballrooms of a resort hotel here. Ericsson set up the network at a Qualcomm event to give press and analysts a first look at what its new chip sets will enable. Inseego showed a mobile 5G hotspot it will launch at CES for Verizon’s network. And AT&T demoed a prototype for a cool augmented-reality app requiring fast nets to download to a handset hundreds of Mbytes of content. Tests of millimeter wave services are going better than expected, carriers said. In addition, handset makers have an unnamed alternative supplier of mmwave RF front-ends beyond the module Qualcomm announced in July. The “fifth generation” of telecommunication systems, or 5G, will be one of the most critical building blocks of our digital economy and society in the next decade. Europe has taken significant steps to lead global developments towards this strategic technology. 5G will provide virtually ubiquitous, ultra-high bandwidth, and low latency “connectivity” not only to individual users but also to connected objects. Will You Own a 5G Smartphone in 2019? Verizon and Samsung recently announced a successful data transmission using 800 MHz of bandwidth at 28 GHz, resulting in a maximum throughput of almost 4 Gb/s. This news certainly highlights what mmWave bands can bring to the table. Nokia Bell Labsin vetämässä LuxTurrim5G -ekosysteemissä kehitetään 5G-tukiasemien sijoituskohteiden lisäksi uusia käyttökohteita. Näyttötaulujen ja valopylväiden lisäksi on kehitetty jo 5G:n perustuva bussipysäkki ja 5G-signaalit paremmin läpipäästävä ikkunarakenne. 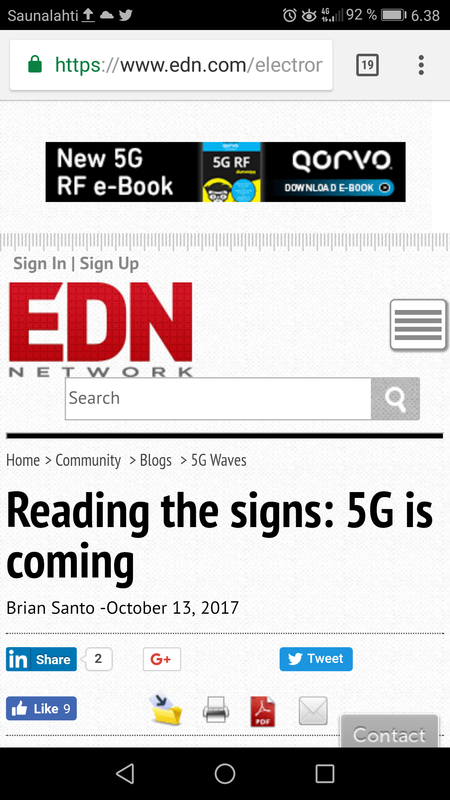 5G. You’ve been hearing about it for years, and now it’s just about here — or, at least, the beginning is just about here. Sure, widespread use is still a few years away, but before handset manufacturers, embedded devices for industrial applications, connected cars, and the like begin to take hold, some infrastructure needs to be in place. China is determined to control fifth-generation wireless technology (5G) networks, posing a threat to American telecommunication firms and raising national-security concerns. To win the next-generation mobile race, the U.S. government has to act fast, an expert warns.